Interesting Schedule:The average TV watcher then would have said:"All these old moldy shows? I'd rather watch 3, 5, or 8! "..These days, we would love a similar schedule on TV Land..
At first all they had was News and the filmed programming as shown above..and all Black and White at first. Plus they were only on 5 days a week..By 1968 They had added Sunday Hours but only from 8:25 AM-1:30 PM! At first, any Saturday programming would be minimal. wrapped around a High School Football or Basketball game..Mostly from Canton's Fawcett Stadium or Memorial Field House or Canton Civic Center. Eventually there would be some local programming such as Sidelight 17 and Talkback, which appears to be a phone-In show..Movies were not the blockbuuster hits..Mostly very old..and not good prints, either.. Next:1970-77..The best attempts at programming..17 goes color..
SideNote:I'd like to thank the Stark County District Library Periodical Department for help with copying the Channel 17 pages I got the ads from, etc..the Lady spent a lot of time trying to make the copies look as good as possible..It was very hard finding much about the early days of this station..This is probably the first time anyone has done much with anything online about WJAN-TV 17..
January 2, 1967 Ad in the Canton Repository for the "Electronics Center" on Canton's Cherry Avenue NE..Selling UHF converters to receive WJAN-TV 17, due to sign on January 3. The Electronics Center was open into the 1990's and still may be. 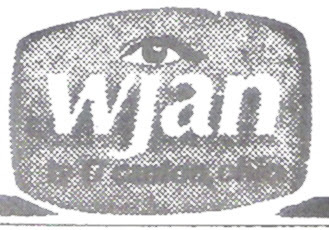 It was rumored they still had some UHF converters at that time, too..
Today we'll look at the history of WJAN-TV 17 in Canton. 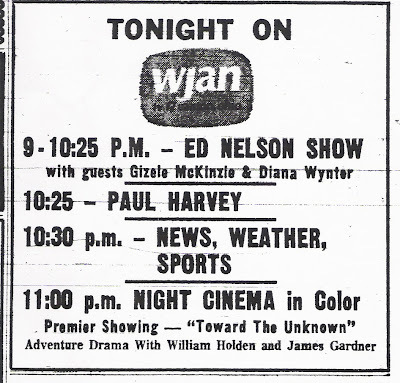 TV in Canton/Stark County has sort of a sparse history until the mid 1960s. In the earliest days of commercial television, there were allocations for "Channel 1" as what would be known as "community stations" Low-Power units that would serve small areas..Canton was listed for a Channel 1 allocation in 1946. 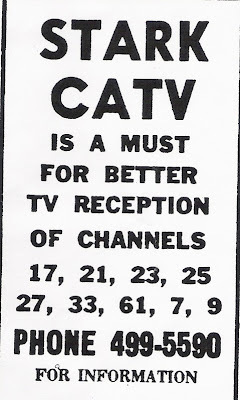 Around the mid 1950's plans were laid for Tri Cities Telecasting to operate Channel 29 as WTLC-TV in Canton. The 1958 Canton City directory shows this station at 324 Market Ave. N. In Canton, with Morton Frank and Loren Sourers jr. as officers. I have never seen that this station ever made it on the air. 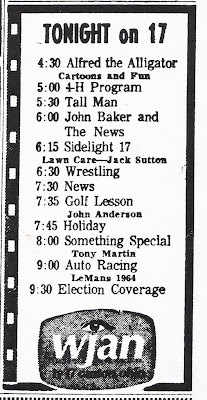 There was also planned WMAC-TV on Channel 23 in Massillon, which also never made it on the air. Below is a short article (one column) of WJAN-TV's Sign-On..
Eollowing its opening day of broadcasting, the 105kw station will be on the air from Monday through Friday fron 4:30-10PM with transmitting equipment designed to provide a strong signal anywhere in Stark County. The daily program schedule includes three news programs, a feature movie at 8PM, and film series in the Western, Mystery and Comedy categories. John Baker is the station's News Director and he will be seen weekdays at 5:30, 7:30 and 9:30 PM. Harold Gorsuch,former superintendent of electronic systems for the Ohio State University, is chief engineer at the station, While Frank Buchtel, former manager of Canton radio stations WCNS/WCNO (900 AM/106.9 FM-Ed.) is director of sales. Studio transmitter and tower are located on Route 62 at California Ave. NE. Five miles northeast of Canton. The Station is owned by Janson Industries of Canton. Editors Note:I was under the assumption this show originated from WNBK-when it actually was from WNBQ-TV 5 Chicago..
Wev've been here for nearly 6 months and the response has been fantastic..I appreciate all who stop by and check us out..Just want to mention a few things..
First, I honestly appreciate those who take the time to leave comments, even to correct me on facts, dates, etc..Also, I have only had to delete 2 comments, and those were for spam rather than anything really offensive..
Secondly, regular readers will notice that I have started using some You Tube for posts.You Tube makes it very easy to add text to any video and send it directly to Blogger.com. A side benefit is the YouTube player includes "related" video in thumbnail form one can play as well..I should mention though that some of the "related" video in my mind isnt all that related, and a few videos might not all be family-oriented..I will try to look to make sure everything is as G-rated as possible,,and see if there is a way to remove potentially offensive videos before I post them..
Thirdly, I have added some new links recently..Clarke Ingram's fine DuMont History site..Michiguide-Daily updates of Michigan Radio and TV..Nostalgia Links-Martin Grams is a fine Old Time Radio Author..His wife is collecting Links related to Nostalgia Radio, TV and other subjects and offering a clearinghouse for nostalgia and information about by-gone days..
DuMont Television Network in Ohio..and the Pittsburgh Connection. 1953 WDTV-Channel 2 Logo-Courtesy Clarke Ingram..He has an outstanding DuMont history website..Linked at the right. The DuMont (pronounced Dooh-Mont) TV Network ID's in the previous post serve as an introduction to today's topic. Allen B. DuMont founded DuMont Laboratories in 1931. Although involved in many areas of electronics, his company was best known as a manufacturer of TV sets. DuMont began the first US television network in 1946, with WABD-5 in New York and WTTG-5 in Washington, DC. DuMont added a third station, WDTV-3 in Pittsburgh on January 11, 1949. It was at that date that the East-Midwest Coaxial Cable was completed, allowing live broadcasting as far west as Chicago to be seen in the East and Vice-Versa. By the time DuMont arrived in Pittsburgh, NBC and CBS were established as the main TV network players in the US..ABC was just starting and effectively was the "forrth network" in the early 1950'a. DuMont had a decent shot to be a viable network early on..
WDTV was the first and only VHF TV station in Pittsburgh for over 8 years, Only competition being 2 UHF's (16, 53 both on the air-and off the air quickly) and Educational WQED-TV 13. till WIIC-11 came along (NBC) in 1957 and WTAE-4 (ABC) in 1958. This created a unique situation for DuMont in Pittsburgh, The 7th largest US Market at the time. Closest VHF-TV to Pittsburgh were channels 7 and 9 from Steubenville/Wheeling and Johnstown's Channel 6. 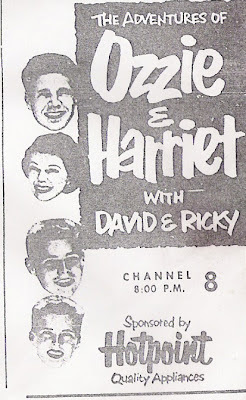 WDTV cleared many of the DuMont Network shows in pattern but were able to cherry pick the other networks' best shows, running them at all hours of the day and night. DuMont used its leverage in Pittsburgh to gain affiliates in other parts of the country. Westinghouse paid a premium to get Studio One live clearance in Pittsburgh over WDTV. These arrangements helped keep DuMont in Business..After ABC merged with United Paramount Theaters in 1953, the ready infusion of cash helped ABC to upgrade its programming. DuMont, which had always run the network on a shoestring anyway as far as program production and talent was concerned, was in worse shape. Desperate for cash, DuMont by 1955 had sold WDTV (now Channel 2)to Westinghouse, which promptly changed the call letters to KDKA-TV after it's pioneer radio station. Prrimary Network was now CBS. The money helped for a while, but the writing was on the wall..DuMont was out of the network business by the end of 1956. They couldnt acquire more stations to help with program clearance and with ABC doing more filmed shows in Hollywood...DuMont as a tv network was pretty well done. WABD and WTTG were sold to Metromedia and eventually in 1986 became the cornerstone for the FOX Network..
From TV Digest of Pittsburgh-Only carried channel 2, WJAC 6 and WKBN 27 Youngstown. Three stations in a radius of 223 miles. 11:15 Double Play-Leo Durocher and wife Laraine Day-Interview-Syn. Sponsored by Westinghouse, Which happened to be headquartered in Pittsburgh. It was said that the company paid a premium to buy the Monday 10PM time from DuMont. 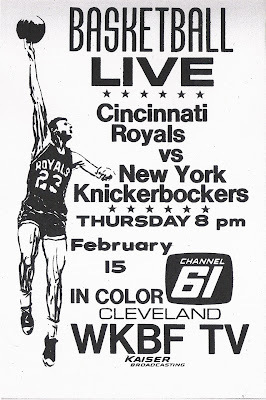 6 in Johnstown and 27 Youngstown aired this at the same time-The Only show on all 3 channels at once. 5:30 Terry And The Pirates-Syn. 5:30 Mon. Wild Bill Hickok-Syn. 8:30 The Big Issue-ABC Hubert Humphrey, Dmocratic Senator from Minnesota and Representative Noah Mason (Rep. Illinois) discuss a National Sales Taz. Today, In honor of the recent Ghoulardifest and especially of Bob "Hoolihan" Wells, the featured video will be "Hoolihan Nite" on Big Chuck ond Lil John on September 24, 1994..Bob Wells was the noon weatherman on Channel 8 in 1966 and auditioned as solo host on "Shock Theater" after Ernie "Ghoulardi" Anderson left for the west coast..He enlisted Director Chuck Schodowski, who worked with Ghoulardi, to help him with the audition..Channel 8 liked the chemistry so much, they teamed "Hoolihan and Big Chuck" starting December, 1966. Hoolihan stayed until 1979 when he went to a Christian TV station in Florida.He has been living in retirement in Clearwater Florida..doing outdoor theater with his wife Barb, who recently passed away..A fine broadcaster and by all accounts a really nice man.. Yet another amazing You Tube find: A WJW-TV 8 Franz The Toymaker episode.Showing the Kids how to make a homemade Kite..(2 part video-second part should be in the "related" videos" menu.) In the video itself:Part of a McDonalds Ad..A WJW station ID brsgging on "176 color programs" This week..The second part of the Video has Milky Way and Three Musketeers Ads.. 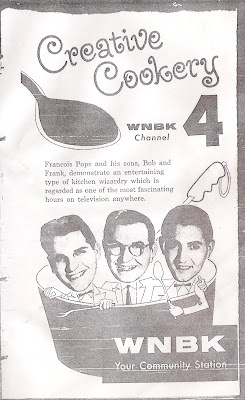 This is special to me because I have never seen Franz up to now..We couldnt get channel 8 in my location when i was little..The Video looks to be from around 1969-70..
WUAB's "Ten O Clock News" made it's debut in January 1988..The original anchors were Bob Hetherington, Romona Robinson, Frank Cariello and Gib Shanley previously of KYW-3 and WEWS-5, as Sports Director..The market was ready for a 10:00 news show and ratings grew steadily..Hetherington was replaced by Jack Marschall and Robinson left for WKYC-TV 3 eventually, where she has been for over 10 years. Sally Bernier handled weather chores for a time..The news continues under the "19 Action News" banner to this day..
As hinted above..changes took place in the mid 90's to television all over the country. 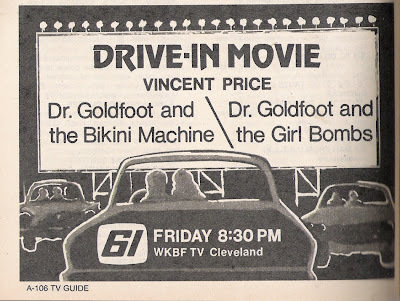 The trigger for all this was the change of New World TV stations to FOX affiliation, including WJW-TV 8 in Cleveland. In September 1994, WOIO-19 owner Malrite signed a Local Marketing Agreement with WUAB-43.. In January 1995, WUAB became an affiliate of both UPN and WB Networks. Raycom bought Channel 19 in 1996 and with it, the LMA with Channel 43..In 1997 Channel 43 became solely an UPN affiliate..
Raycom bought WUAB in January 2000..Since then, 43 has lost the OTA Indians games to FSN Ohio, (now on Sportstime Ohio and WKYC-TV) and offers almost no local programming other than the 10:00 News, which is tied in to "19 Action News"..19 has been criticized for its "In Your Face", tabloid style of news..Channel 43 is now affiliated with "My TV" which is still I think trying to find its way as a network. Sadly, much of Channel 43's non-prime time programming consists on informercials.. Final Comment:It is sad that a once great TV station has been reduced to tabloid news, judge shows and informercials as its main programming. I would love to see Channel 43 hook up with "Retro Television Network" For some great classic programming..Maybe even have "43 Vault" with past local programming goodies..well we can dream, can't we?.. 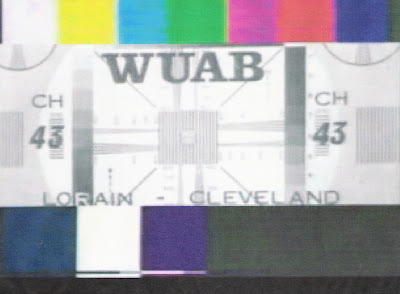 When Channel 43 hit the air in September 1968 as the second UHF commercial station in Cleveland, you would think that with WKBF-61 already well established with Kaiser Broadcasting ownership and a 9-month headstart, WUAB-TV would be at a distinct disadvantage..But with Cable already penetrating parts of the Cleveland/Akron/Canton market and United Artist's deep pockets, the field evened out rather quickly..WUAB-TV also went much more into local programming from the start with shows such as Lorain Conversation, hosted variously by Cleveland TV veterans Alice Weston and Linn Sheldon. Barnaby, coming over from WKYC-TV 3 was also hosted by Sheldon. News updates were provided by announcers Gary Short and Marty Sullivan. 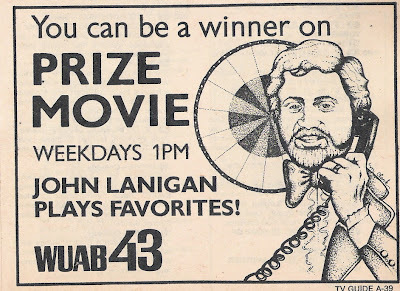 Radio veteran Jack Reynolds did local wrestling shows and also served as a staff announcer.. John Lanigan's Monday-Friday "Prize Movie" was a hit for many years..Sullivan created his trademark character "Superhost" as a host of Saturday horror movies..beginning in 1969 for a 20-year run..
Sports was always important to WUAB, with Ohio State and Notre Dame replays early on..The station then served as flagship station for Cavaliers Basketball on and off from 1973-present and WHA Cleveland Crusaders and NHL Cleveland Barons Hockey in the mid-1970s..The station's biggest coup in sports was grabbing the over the air broadcast rights for Cleveland Indians Baseball from WJW-TV 8 beginning in 1980..Keeping the Indians till 2001 when the Tribe moved all their games to Cable..
WKBF-61 did almost no local programming or sports, which was part of their downfall..It was also hard with 2 competing stations for both to make much of a profit..Kaiser shut down Channel 61 in 1975 and purchased a share of Channel 43 with UA keeping the majority interest. WUAB then took of the best channel 61 syndicated shows and began to establish it's dominance in the NE Ohio independent TV Market. 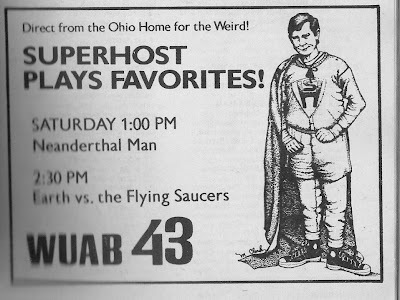 Kaiser Broadcasting sold its stations in 1977 to Field Communications..At this time, UA/Kaiser sold channel 43 to Gaylord Broadcasting, which continued to bolster channel 43's profile, putting the station on cable outlets in several states..WUAB moved into its Parma studios in 1970..remaining until the mid-1990's.